1. Sarah Boone's invention is probably in every household in this country. Her invention of the ironing board in 1892 helps people keep their clothes wrinkle-free. 2. On November 20, 1923 the first automated three way stop light was invented by Garrett A. Morgan. 3. Without J.F. Pickering's invention, the air ship (BLIMP), many of us would not know Goodyear. 5. Grandville T. Woods invented the apparatus for transmission of messages by electricity (Patnet No. 315,368 April 7, 1885), the electric railway system in 1892, the roller coster and the auto air brake among many other things. 7. Car repairs became easier after John A. Johnson invented the wrench in 1922. 8. P.B Downing and E.G. Becket invented the mailbox in 1891. 9. Benjamin Banneker, a 22 year old African American, became the first person in America to build a clock in 1753. 10. Physicist Robert E. Shurney invented the metal chevrons (or wire mesh tires) for the wheels of the "Moon Buggies" that deflected moon dust away from the astronauts on 1972's Apollo 15 moon landing. 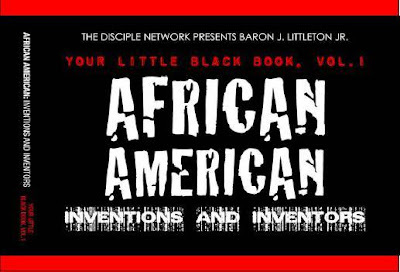 There are 148 Inventions and Inventors as well as 58 List of Firsts in "Your Little Black Book, Vol 1: African American Inventions and Inventors. " FYI - I will be giving this book out to all of our fabulous guests at the February 17th USUAL SUSPECTS EVENT. The invite has been sent out. Check your mailbox. If you haven't received your invite and want to come play and have a good time, drop me a line at ecomwealth@bww.com.